#GreenArts is about Scotland’s Green Arts community inspiring others to take action, sharing what they’re doing to improve their environmental performance, learning from others about what sustainability in the arts looks like and how arts & culture are taking action towards a better Scotland in the face of a climate and ecological emergency. Since 2018, Creative Carbon Scotland has hosted #GreenArts Day – a digital event to explore and celebrate the work of the community, and share with their audience members and national and international industry peers. #GreenArts Day is an annual event, with the next one planned for Spring 2020. However, #GreenArts is year round on Twitter, Instagram and Facebook, and everyone is encouraged to share their green work through using the #GreenArts hashtag. #GreenArts Day is part of the programme of the Green Arts Initiative community. Find out more about our conference, community and how to get involved. The Green Arts Community is made up of over 220 cultural organisations in Scotland undertaking fantastic work on environmental sustainability. Each year, members share the activities, plans, efforts, events and engagement they’ve undertaken on the subject, with their feedback forming the basis of the annual Green Arts Initiative Report. This year, we focused on sharing the stories around the different initiatives individual organisations had designed and undertaken themselves – from reducing water waste, to redesigning how they tour productions. We also highlighted the challenges that the Scottish cultural community identifies as the barriers to growing their green work, and how the Green Arts Initiative can support organisations going forward. Take a look at all our case studies. At Creative Carbon Scotland, we’re keen to share the great green work of Scotland’s cultural community as much as we can – co-creating and hosting case studies, or helping to share those which exist on organisation’s own websites. Get in touch with catriona.patterson@creativecarbonscotland.com to talk about how we can help. At Creative Carbon Scotland, we’re aware that with lots of other messages, news and opportunities to share through communications channels, it can be difficult for members of the Green Arts Initiative to find the right opportunity to share their green work. By organising and supporting a single point of focus in #GreenArts Day, we hope that we can compound the impact of individual cultural organisations talking about environmental sustainability, grow the connections and sustainability collaborations between cultural organisations, and highlight the great work of the sector to those in the ‘sustainability world’. Twitter is the primary social medium through which members participated in #GreenArts Day, and how they tend to communicate their green arts work throughout the year. From photos of recycling spaces, images and videos of climate change-themed programming, organisations sharing the specific ways through which they are taking on environmental sustainability were most effective. We enjoyed reading the blog which National Theatre of Scotland tweeted as part of the day. This Twitter ‘moment‘ collects other examples of the activity that took place over the day: there were lots of highlights throughout! The visual-led medium provides a great opportunity to showcase buildings, surrounding environment, or the more aesthetically-pleasing aspects of different activities. Lots of our members shouted about their participation in the community via Instagram, adding the Green Arts Initiative logo to images of their buildings or activities. We loved this one of Pier Arts Centre in Orkney looking serene! Although less popular among the majority of our sector-facing Green Arts audience, Facebook is a great medium for reaching out to members of the public for those with a greater community-focus. We thought Imaginate’s example of showcasing their internal and collaborative building Green Team was a great way to use the tagging features which Facebook offers! From the extent of the activity and the topics discussed on #GreenArts Day it’s clear that the cultural sector is going beyond quick wins to look at how sustainability can be embedded in operations and artistic programming. 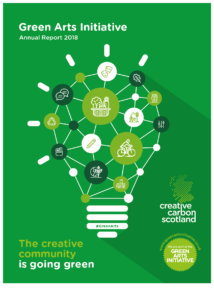 At Creative Carbon Scotland, we’re keen for #GreenArts to be celebrated year-round, and become the regular way through which the sector connects around their shared green ambitions. Take a look at #GreenArts on the social media platform of your choice – see what is already out there, what does well, and get some ideas! Use video, GIFs and images to increase engagement with your social media posts – there’s lots of evidence that people are more likely to click on posts that have some form of media. Make sure you add image descriptions to ensure your posts are accessible to all social media users. Connect with other organisations, themes or campaigns aligned with your work (such as #EarthHour or @ScotGovClimate), and see what relevant awareness days and weeks are happening. Tag @CCScotland in the text or image!